KTS InfoMate is designed and developed in such a way that it can be extended to suit the requirement of any organizations. Whether you are looking for a Digital Signage Solutions to small enterprise or large corporates, KTS InfoMate will be able to easily meet your requirements with little or no customizations. If you are having an existing Digital Signage Infrastructure, the chances are that our software will be able to easily leverage your existing investment thereby reducing the cost to a minimum. KTS InfoTech is a private limited software company having more than 17 years of proven experience in design and development of high quality innovative software products. Apart from software product development, company offers customized software solutions, IT consultancy services and Training to their customers. KTS Customers include a number of companies from US, Canada, UK, Germany, Australia, Japan, Greece, Brazil and a number of satisfied customers from India. For more information, visit the appropriate link below. Features During the past 11 years, KTS designed and developed several software applications for other customers ranging from small desktop programs to large scale enterprise high performance systems. For all of them, like our own products, you'll find one common feature - High Quality. Create and edit different notice board layouts and contents. Transfer of Digital Notice Board contents, layouts etc from source to Notice board Display server through internet. Schedule different events and display it in notice board on specified date and time. Securely transfer Notice board contents over internet to the Display system server. User Management and License Management. Q. 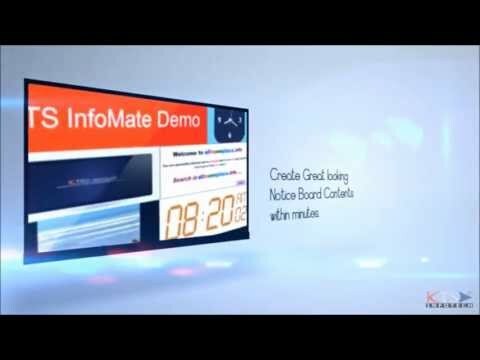 What is KTS InfoMate? Q. What are main components of KTS InfoMate? KTS InfoMate has 2 main components namely Digital Signage Management Software (called KTS InfoMate Client), A Digital Signage Player (called KTS InfoMate Server) and an optional Web Content Management System(CMS) to display the organizations contents from the Website. Q. What are the different types of contents that can be displayed in KTS InfoMate? Q. Can I use KTS InfoMate in Event Management ? Q. What all type of video streaming technologies are supported by this application?